Sylvia White, the creative spirit behind "Galadryl" has created a beautiful bracelet with a set of Bridled Passion nugget beads. She has integrated Bali sterling silver beads, Swarovski bicone crystals, and hand formed spirals and bead caps to create a very lovely bracelet which not only looks good, but would feel great to wear. 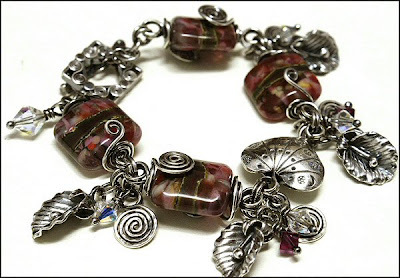 Her spirals in the design coordinate with the square Bali toggle which also has spirals in its design. Teamed up with a super puffy sterling heart makes it all happen! Really creative design, Sylvia, and stunning to boot! Thanks for sharing with everyone. Stay tuned for more Designer creations! Thank you for featuring me, Gail. The Bridled Passion beads look fab and just had to be complimented with lots of silver. The bracelet found a nice home in Switzerland.